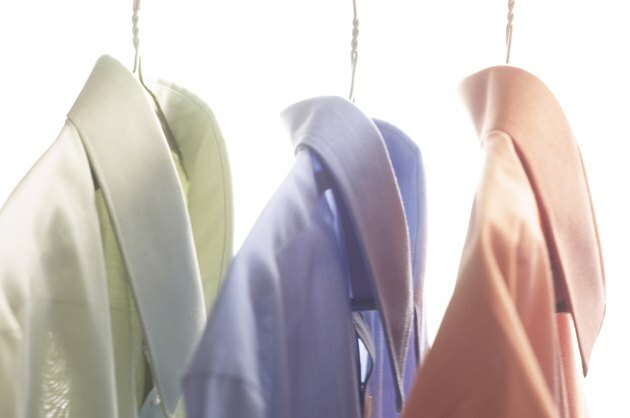 Although no-iron Egyptian cotton dress shirts are available, formaldehyde is used in the manufacturing process, which some connoisseurs claim adversely affects texture. That's why Egyptian cotton shirts typically wrinkle easily and require ironing. Be sure to follow the recommended techniques for pressing the wrinkles out of your fine cotton dress shirts. For a super-crisp look, iron both the inside and the outside of your shirt. And if you prefer uncreased sleeves, roll up a towel and insert it into each sleeve before ironing. Fill your iron with distilled water. Set the iron to its "cotton" setting or to "high," if it doesn't have fabric-specific settings, and turn on the steam function. A high temperature setting works best for 100 percent Egyptian cotton. But if your shirt is blended with a synthetic fiber, or you have any doubts about the fabric's composition, start with a medium setting and gradually increase it. Start with the collar -- laying it flat on the narrow end of the ironing board, with the wrong side up. Slowly press the point of the iron into the fabric until no wrinkles remain. Then flip the shirt and do the same with the collar's visible side. Move to the cuffs. Start with the inside of the cuffs and then proceed to the outside. If there are any puckers in the fabric, iron them in the direction of the seams, where they won't be noticeable. Move to the shirt front. Start with the button side, working the iron's point around each button. After that, move up to the top of the shoulder, and work your way down the shirt. Repeat the process on the other side. Iron the back. Begin with the shoulder and yoke area and slowly slide the iron down. Tackle the sleeves. The sleeves can be frustrating, because while pressing the wrinkles out of the top layer, you can inadvertently iron creases into the bottom. Amalfi Shirts of Australia has an excellent recommendation for solving this problem: Slip a piece of cardboard between the layers of each sleeve. Or use a rolled-up towel. Inspect, button and hang. Make sure you haven't missed any spots. If your freshly ironed shirt passes muster, fastening the top and first buttons while it's on the hanger will help keep its shape until you're ready to put it on. Although you're using a steam iron, extra-wrinkled shirts will get better results if the cotton starts out a little moist. Spritz the fabric with water from a spray bottle as you iron the shirt. Or use spray starch, if you prefer. Even though Egyptian cotton is widely considered the finest in the world, only about 10 percent of that country's overall production meets the lofty standards associated with this essentially generic name. In 2001, the government of Egypt moved to protect the reputation of the cream of the crop with a distinctive trademark, a pyramid enclosing a cotton boll, confirming that the product is manufactured from 100 percent premium Egyptian cotton. Always iron around buttons, never over them. Alexander West: What Is Wrinkle-Free Cotton? Duckprint: Egyptian Cotton, Supima &amp; Upland -- What Does It All Mean?